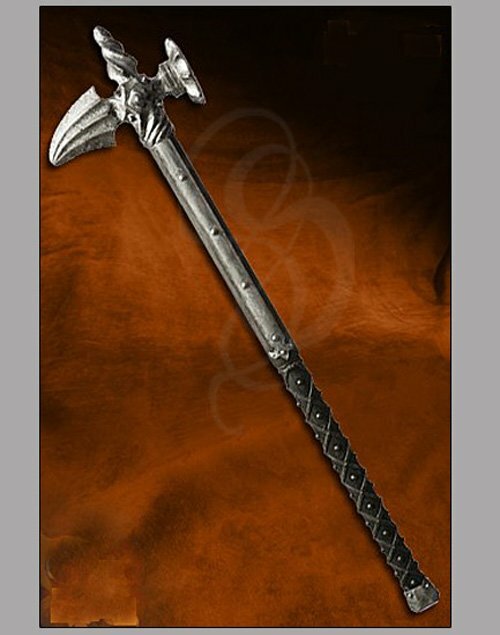 High End Foam Rubber Hammer with Runes - Last two in stock for sale, these are discontinued. This really is not your typical warhammer. And no, we are not just talking about the fact that it's made out of foam rubber. This is a combination of several styles of warhammers (standard warhammer, Bec de Corbin, etc. ), with a little bit of fantasy thrown in for good measure. It's a part of our Conqueror series and is about the coolest spiked warhammer that you will ever see in foam. The head of this hammer is beautifully cast, with spiraling top spike, flattened head and beveled rear spike. Every inch of the head's surface is decorated and scored for a truly impressive look. Oh, and have a look at the shaft. Nice looking steel eh? Wrong! It's not steel at all. It's made of scored and textured foam that looks unbelievably like real steel. The shaft is wrapped in what looks like leather strips at the base (again, not real leather, but looks incredibly real). A steel looking buttcap at the base of the haft seals the deal. The core of this hammer is a high performance carbon rod that is unearthly strong and durable. You won't be breaking this hammer. Take care of it, and it will be a part of your arsenal for life. Our Conqueror line of foam swords are the most realistic foam swords that we have ever seen. The molding process and high quality foam used on these hammers allows for an amazing amount of detail and the designs take full advantage of this. And though great looking, their durability may be even more impressive. Two different styles of spine rods on the Conqueror swries allow you to customize your game. One style is made of fiberglass and reinforced with polyester for strength and power. The other style is made from a carbon/fiberglass combination. These latter are considered the "Performance Series" and have a little more spring and a bit more durability to them, but not so much that you'll really notice when using it. Both styles are extremely durable and are fused with the blade and pommel to prevent slippage or torquing. Our Conqueror lines are relatively realistic in weight (about 1 pound or more) and feature a more "rubbery" feel to them. . These are monstrously durable and have a legendary lifespan. They can be twisted and torqued like a wet rag and they will still return to true form instantly. Safety is top notch on these, with tip flex-enforcers and a good thickness of foam throughout. The Conqueror series hammers made from a proprietary foam with no latex at all. The molding process allows all of the elements -- the composite rod, reinforced tip and quality polymers to merge into one solid item. The foam is insanely durable -- it resists punctures and returns to shape no matter how much you deform it. A fiber matrix of fiberglass and nylon (or Kevlar/polymer depending on the hammer) increases the safety and creates a progressive absorption for less painful hits. Weather resistance is another great strength on these. These hammers have been immersed in water for two weeks and then dried in the sun without any damage whatsoever. The Conqueror series can be used at almost any temperature. -22 degrees Fahrenheit up to 212 degrees Fahrenheit (for those of you playing on one of Jupiter's moons). The foam stays soft, no matter the temperature. With all the technological features, you sometimes forget that there are works of art. Perhaps the best looking swords on the market.